A couple of weeks ago I was in London. A sweltering, tourist crowded, sweaty, dirty London. I jumped on the number 24 bus at the bottom of Tottenham Court Road and within thirty minutes I reached Hampstead Heath. I have never been before, had only see it on films and TV – Notting Hill, Smiley’s People. 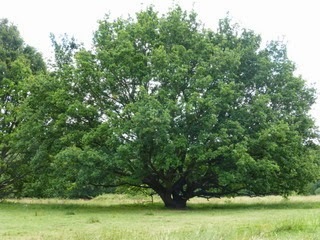 I expected it to be like the other London Parks, manicured and prim but it’s not, Hampstead Heath is wild. 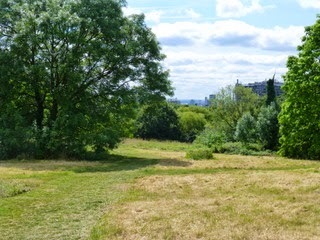 I began my walk at Hampstead Railway Station and scuffed by feet uphill through rough stubble and newly cut grass. Benches perched randomly on the hillside, left for anyone willing to climb the slope to take in the breadth and beauty of the trees and the odd glimpse of the city. Two competent dog walkers with twelve dogs between them seemed comfortable with the surroundings so I followed them for a bit then swung low to meet a well-made path. This took me to a causeway where two boys fished in a pond. Notices advised against disturbing the water in respect of the swimmers. 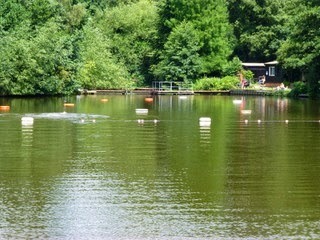 At the far end of the pool was a jetty behind which wooden huts huddled. In the water I noticed a bald head heading toward a string of buoys about twenty five metres from the jetty. An elderly gentleman, the only one in the water, reached the barrier and hugged it, taking in great whoops of breath. Bravo, I thought and before I had the chance to take out my camera, he was thrashing back the way he came. This was the Mixed Pool. 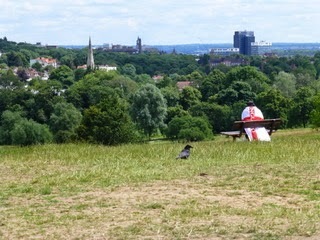 From here I climbed Parliament Hill where I was rewarded with the iconic view of London only previously seen on the small screen but I was then saddened to see a dejected English football supporter, draped in his flag, gazing with awe at his green and pleasant land; wondering, no doubt, where all his World Cup dreams had gone. I followed the path down to Highgate, toyed with the idea of looking for Karl Marx’s grave but in the end caught a bus back to Kings Cross. Walking is hungry work so I stopped off at The Quakers’Friends House café for lunch. This decision was impulsive. I had been passing the place every morning for the past week, it was close to my hotel and the menu on the board outside looked tempting. And they had a bookshop! The lunch can only be described as OK. A dry scotch egg with salad. The bookshop was more interesting. I am not religious but am interested in the different philosophies religions explore. This bookshop had many on offer but one book caught my eye. I have been familiar with Al Alvarez’s work for a number of years. I always believed he was an American climber who was also an excellent writer. I have enjoyed many of his articles, stories and poems in various climbing magazines through the years. He wrote the introduction to the iconic short story collection The GamesClimbers Play. I vaguely remembered he played poker. I read the blurb about his previous publications, it turns out he is British and a writer and critic who climbs, how could I have got that so wrong? The book was subtitled A Swimmers Journal; he had added another activity to his already full portfolio. I almost fainted with shock when I read the author’s profile and saw his photo. The book journals the last few years of the author’s swims in pools at Hampstead Heath and charts his slow decline into old age. The photo shows an old man, bald head, and grey moustache above a rather pained smile. I was convinced the man I saw only an hour before in the mixed pool was Al Alvarez. The coincidence made me giddy. What made me go to those pools? I had no idea they were there. What made me go to the Quaker House? The only reason I picked up that particular book was I knew the name –I thought he was an American climber! It was weirder than weird. Of course I had to buy the book. The journals begin in 2002 and charts Alvarez as he stumbles from his home near the Heath to the ponds for his swim. He swims all year round and along with a daily water temperature he lists the birds and the blossom, the changing seasons. There is a real sense and love of the place. The shifting cast of characters are wonderful, fellow swimmers (mostly ex-athletes) and lifeguards. It is like an old boys club and very companionable. The author is pained by a bad ankle that plagues his walking and as the years spread over the pages he becomes more and more debilitated, suffering a stroke and many falls. His frustration is heart breaking but I shy from feeling sorry for him because that is what he loathes most. By the end of the book his life is a constant battle against pain and his declining years. This is an amazing insight into what we all must face one day; this man’s struggles should give us the courage to face it with dignity. The book only chronicles up to 2011 and by the end I began to doubt whether it was Al Alvarez I saw that day. I hope it was because it means he is still winning.